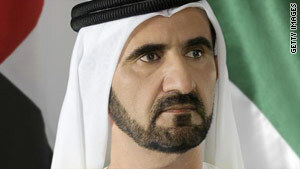 Ruler of Dubai and Prime Minister of the UAE, H.H Sheikh Mohammed Bin Rashid Al Maktoum. This week MME talks exclusively to H.H Sheikh Mohammed Bin Rashid Al Maktoum, Ruler of Dubai and Prime Minister of the UAE. From the region's largest airport, the largest airline and the largest trade port, in the past two decades, Dubai has created a name for itself in finance, tourism and logistics. But the past six months have included a whole different set of challenges. It has restructured 23 and a half billion dollars of Dubai World's debt and is now dealing with the debt of other companies. In an exclusive interview during his annual visit to Royal Ascot, MME sat down with the Ruler of Dubai and Prime Minister of the UAE, Sheikh Mohammed Bin Rashid Al Maktoum and asked him how the Emirate carved out its niche and the lessons learned from the financial crisis.